I've seen a lot of videos featuring different jet pack creations, it really has become a reality that people can fly by just wearing a device on their back. Think James Bond and Rocketeer. I never had any idea that one can already experience it until my brother Jim told me about it. 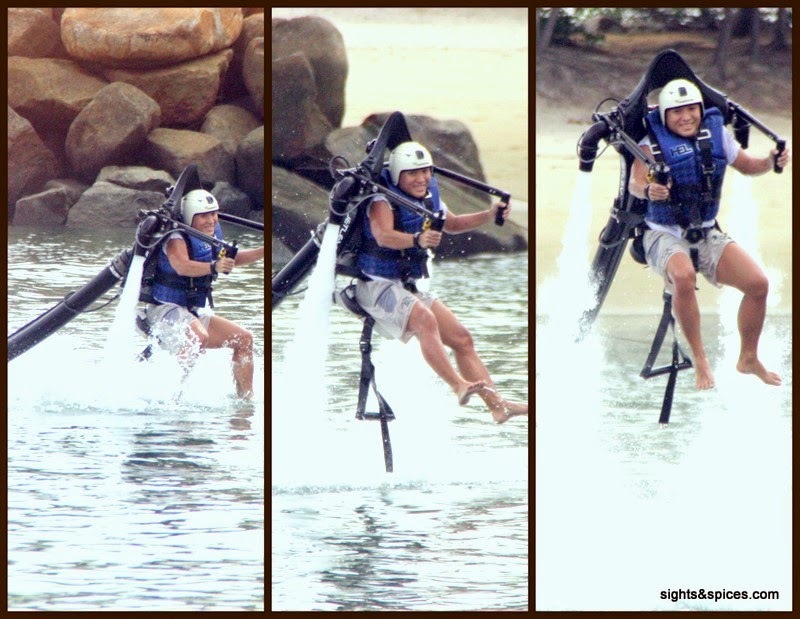 It was in Sentosa, Singapore where one can have the thrilling experience of flying via a jet pack. Jim got a voucher from Seabreeze, the company which provides water sport activities. 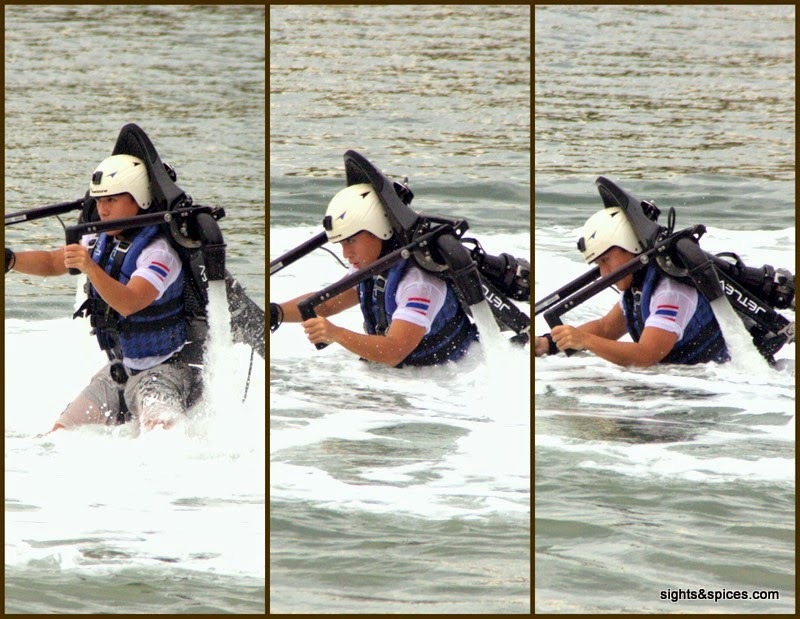 One of the most sought after water sport activity in Siloso beach is the Jetlev or the Water Propelled Jetpack When I recently visited Singapore, I tag along with Jim to watch him fly in envy. It was a gloomy day with a lightning warning being announced. But this didn't stop us from from proceeding to Wave House, Sentosa. Luckily after about an hour, the warning was lifted and Jim proceeded to get ready for his initial flight. Before hitting the water, he was given basic instructions by Ms. Christina Tran, the director/coach/instructor of Seabreeze. Christina even went all the way to California to learn and get her certification to teach. It wasn't as easy as I thought it would be, just as when Jim is about to take off, he would swerve to his right and sink back in the water. I can hear Christina shouting ecstatically, everybody was cheering on the shore, me included. It was an amazing spectacle to see, Jim was actually FLYING!!! Jim was having his time of his life. From the time he took off, he was grinning from ear to ear and he never lost that smile the whole time we were in Sentosa. He even managed to wave hi while flying pass by me. I asked Jim how it was, replying with a big smile he said "IT FELT GREAT!!!." After seeing him doing this, I was dying in envy, I've already list this down in my bucket list and vowed to try this once I find myself back in Singapore. End Note: Jim would like to send a big Thank You to Ms.Christina Tran and the whole Seabreeze team who made his of dreams of flying come true.